Chittenden County is situated on the Northwest side of the state below Franklin County and is at Lake Champlain's doorfront. 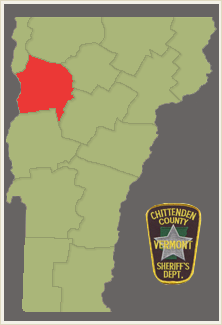 Chittenden County is 614 square miles in his state's most populous County with approximately 157,491 people. The shire town is Burlington and the County was incorporated on October 22, 1787. **Earl McLaughlin was the last Sheriff of Chittenden County to live in the County Jail. Sheriffs in Vermont ran and lived in the County Jails until the Vermont Department of Corrections took over the County Jail function on April 1, 1969. Sheriff McLaughlin lived in the County Jail with his wife Theresa McLaughlin and their 11 Children, 8 of whom have the distinction of saying they were born in a "County Jail."